Make sure you check out part one of my blog, published two weeks ago. Teeth came up in another story in 2010. Researchers were quoted as saying that modern humans, traditionally thought to have evolved roughly 200,000 years ago in East Africa, now might be 400,000 years old. In addition, they may have evolved in Israel rather than Africa. Twice as old and not from Africa, was the message spread by the media. The evidence? A few teeth found in Qesem Cave. DNA made the headlines several times this past year. 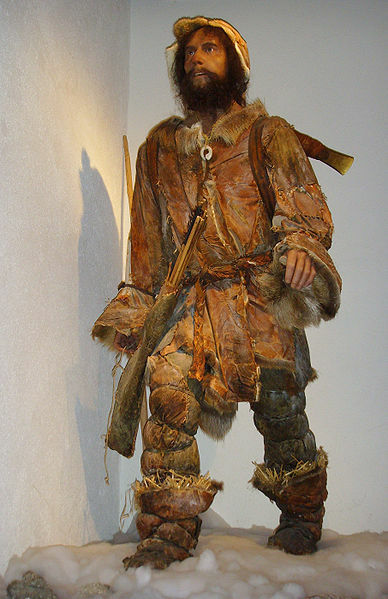 In August scientists announced that they had decoded famous ice man Oetzi’s genome. This is interesting in itself; it would be even more interesting if we could compare his genetic makeup with the genome of the Tarim Basin mummies. Such a genome has not been decoded yet, so we will have to wait. Imagine, however, the potential such a comparison would present to evaluate the origins of these Caucasoid mummies. First, it seems that a lot of trailblazing research is now based on minute amounts of evidence, a finger bone here, and a few teeth there. Second, the fact that we are dealing with minute amounts of information does not detract from the importance of the scientific contributions these data have made. Third, some of the data are microscopically small. Size notwithstanding, DNA and DNA analysis have become a very valuable component in retracing human origins. I would like to end with an observation and a comment. In March 2010, the Smithsonian’s National Museum of Natural History proudly opened its doors on the completely renovated David H. Koch Hall of Human Origins. It is a wonderful exhibit, sharing with millions of visitors the scientific basis of our understanding of human evolution. 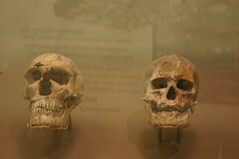 Here is a photograph as it appeared in the media (AP Photo/Jacquelyn Martin), showcasing two of the three original skulls on display. In an age where the human attention span seems to be measured in minutes, let alone days or even years, it is good to remember that in 2007, there was another original fossil on display in the US. The venue was the Houston Museum of Natural Science. The original fossil involved was that of Lucy. In a very savvy media campaign, several leading paleoanthropologists engaged in variations of an ad hominem attack, and used rather unfortunate language to refer to the museum, as well as the curator of the exhibit. Less than three years after invoking this document, the National Museum of Natural History now finds itself doing the very same thing it once so vehemently opposed. Moreover, an internet search in the days following the opening of the new hall in Washington failed to identify any criticism by the same individuals who in the previous case had brought out the big guns. As the first anniversary of the hall is just around the corner, still not a word of criticism has been uttered. I usually expect such hypocrisy from creationists, but from actual scientists? yeesh. But i guess it’s ok because it’s the Smithsonian! Yeah! They can get away with it because they are so big and special! No one should be above criticism. Failing to be consistent shows how weak their arguments were.